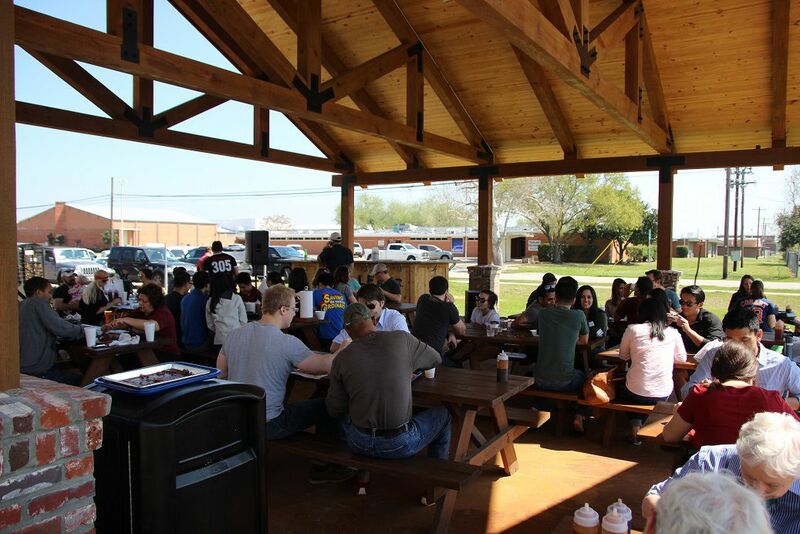 On March 14 Killen’s Barbecue in Pearland offered a brisket flight. The term “flight” is leveraged from the beer world, where a flight is a sampling of multiple beers. Offered in a smaller size than a normal glass, a flight allows one to sample multiple beers to experience the flavors across multiple varieties or brands.The brisket flight offered was similar in that the plate included four large slices of brisket from four different sources with high end grading; Snake River Farms Wagyu, Strube Ranch Wagyu, Creekstone Farms Prime and Certified Angus beef. Killen’s normal supplier is Creekstone Farms. If you aren’t familiar with Wagyu, it is the same family of cattle (of four breeds) that is used for Kobe beef. Kobe is to beef as Scotch is to whiskey; to be labeled Kobe it must be processed in a specific location in Japan as well as other requirements.If you aren’t familiar with Kobe, the short version is that the product is world renown for its flavor and marbling. The price of Kobe is staggering, and Wagyu is an option that allows high end beef in the US without the highest cost. However, don’t think Wagyu is a bargain, Wagyu brisket pricing can run up to and over $200 for a single raw brisket; add in the production costs at a BBQ joint such as rent, wood, and staffing and you can easily see it is still an expensive proposition. I’ve had Wagyu barbecue beef on two different occasions but each time the joint that produced it didn’t offer a more standard cut to compare. It tasted significantly better than the other offering, but one really can’t judge it unless the same person or entity cooks it in the same manner, with the same rub, at the same time. 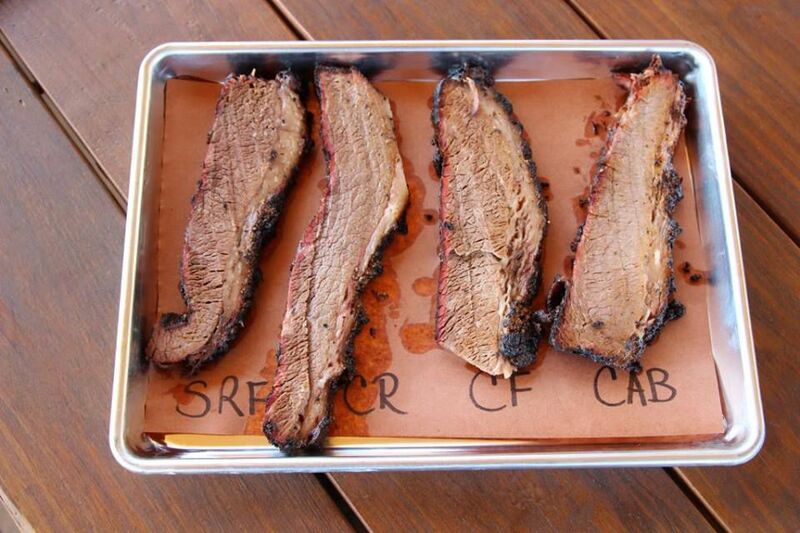 The brisket flight cost was set at $30 which I felt was very reasonable considering what was involved. It included one large slice of each of the suppliers, and was placed onto a tray with identification of each. In talking with Ronnie Killen after my tasting he explained they went to great pains to ensure there were not mix ups on the briskets, and I confirmed as I watched the meat cutter move the briskets over to the cutting table one at a time before carefully placing them back. I sat down and began sampling. While my expectations were obviously high for the Wagyu, in my taste the CAB had more flavor, and even a hint of sweet in the rub that worked its way deep into the meat, but it wasn’t overly sweet. The Wagyu was great, but I was stunned that I preferred the CAB. I walked over to Ronnie and stated my puzzlement. He said the CAB had a bit of a different preparation, with the rub indeed including some sugar, and the brisket had a light coat of mustard before the rub was applied. The meat had also been slightly aged. He went on to explain that the mustard seems to open up the pores of the meat and allow a deeper penetration of the rub. 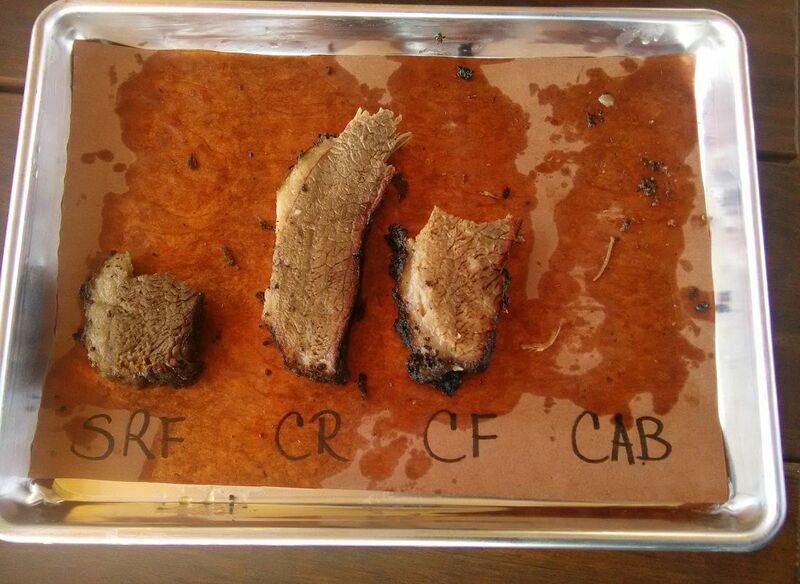 Before you think the prep causes the mustard to negatively affect the flavor, John Lewis of la barbecue has used a similar process on his briskets with great results. So the surprise winner was essentially disqualified since it had different prep, but I’ll still say it was my favorite. Runner up was the Snake River Farms Wagyu. Not far behind was Creekstone Farms. A bit further back was the Strube Ranch slice. So what does this mean? Well it means that when a brisket is cooked identically, that I don’t think the cost difference of Wagyu is worth the expense. A nice cut of steak may offer a little better insight into the taste differential, but it would be difficult to identify. Secondly, that even a slight variance in preparation can make a quality difference that is greater than the breed of cattle or beef supplier. A high quality supply of beef is a great start, but preparation, rub, and skill of the cook is a larger factor in the taste. As a side note, in the lengthy discussion I had with Ronnie Killen I learned that he continues to tweak his rubs and prep. He also continues to ensure his suppliers are top notch – and not just of the meat. He had recently even changed his wood supplier to one that cost more than twice as much as his previous one. His attention not only to detail, but an ongoing desire to perfect the craft even with the current restaurant’s popularity really impressed me. A certain message board pokes fun at the fact that he isn’t the one manning the pits (he has a talented staff), and I understand that there is a certain admiration of those that do so day in and day out, but don’t think for a moment that he isn’t involved intimately and driven to produce great quality barbecue.